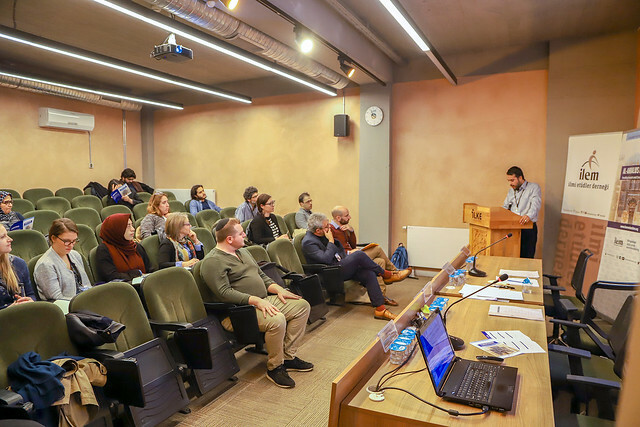 The international conference of Al-Andalus in Motion: Travelling Concepts and Cross-Cultural Contexts kicked off in Istanbul on November 15-16, 2018. Scientific Studies Association (ILEM) as a partner of Language Acts and Worldmaking Project was organizing this conference with the attendance of 21 academicians from 9 countries. Language Acts and Worldmaking is a flagship project funded by the AHRC Open World Research Initiative, which aims to regenerate and transform modern language learning by foregrounding language's power to shape how we live and make our worlds. Language Acts and Worldmaking examines language as a material and historical force which acts as the means by which individuals construct their personal, local, transnational and spiritual identities. Learning a language means understanding the historicity of concepts, beliefs and social practices—how they operate in the past and present. The history of Iberia, as both an originator and a product of global colonization, constitutes a field of study for interrogating fundamental concepts of contemporary liberal-democratic societies. The ‘Iberianate venture’ embraces the ‘Al-Andalus’ syndrome (Islamic Andalusia as a model of tolerant co-existence between Christians, Muslims and Jews), the Iberian ‘Black legend’ (repressive Inquisitorial Catholicism, imperial brutality, economic backwardness), and Sefarad (an ambiguous place of home and exile for Iberian Jews). Within the framework of the ‘Traveling Concepts’ strand of Language Acts & Worldmaking, this conference will focus on the many ways in which Al Andalus becomes a figure of thought, a means by which societies, minority groups, and individuals past and present represent and critically engage with questions of religious pluralism, intercultural contact, and national identity. The conference was the hosted by ILEM Association Building in Uskudar, Istanbul on November 15-16, 2018. © 2019 al-andalus — All rights reserved.